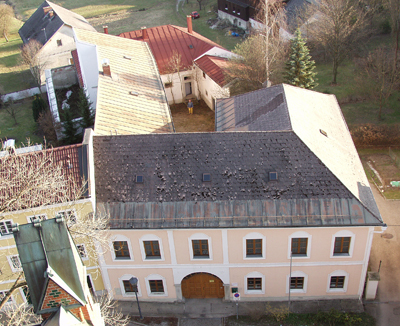 2005 – Aigen`s Courthouse and Prison, located behind the church in the centre of the village, is a perfect size and lay-out as a visitor attraction and for the housing of the Treadwell Collection and Gallery. The building`s pretty courtyard is an atmospheric venue for events, and the four converted cells of the former prison, as well as being art environments, make ideal guest rooms for visitors. Nick himself lives in what was previously the warder`s flat. The two adjoining buildings, once society`s symbols of justice – of right and wrong, are a perfect setting for the Treadwell Gallery and Collection with their many works on the subject of human weakness and strength. The Treadwell Gallery has always been known for its sculpture and the exhibition in the 7oo sq metre space particularly features the work of long term Gallery sculptors, Graham Ibbeson, the late Robert Knight, Malcolm Poynter, Michele Howarth, Kevin Harrison, Dean Barrett, Saskia de Boer, Matt Ensor and Mandy Havers. The courtyard frontage of the prison and it`s interior are painted vividly pink, and it is now known as the pink prison to indicate it`s more sensitive new life. Aigen is next door to Schlägl, with it`s Monastry and famous Beer. It is 15 kms from Hochficht, Upper Austria`s excellent Ski Slope, 7 kms from the Jazz Village of Ulrichsberg and only an hour from the historic cities of Passau (Germany), Krumau (Czech Republic) and Linz(Austria). Aigen is served extremely well with a wide variety of Hotels and Pensions and is an excellent base to explore some of Europe`s most fascinating cities. Prague, Munich and Vienna are only2 – 3 hours away, and Budapest 4 hours. Entrance is €5.00 including an hour long guided tour. School Parties are welcomed.